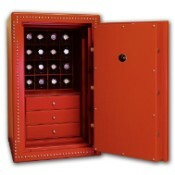 The Underwood Safe is the safest way to protect your luxury watches, both automatic and non-automatic, and all your jewelry items as well. The Underwood Safe uses 50mm armor steel plate on the walls internal and external and 70mm steel for the safe door. Welded across the inside of both walls are also a series of steel rods. This is so that if the walls are cut then the cut section cannot be removed without actually cutting through the rods as well. This rod system is welded on both sides internally. There are also a series of shorter rods welded to the inside attaching the outside and internal walls. The space between the walls is filled with cement; this adds weight to the safe and solidifies the whole construction. The safe is also fire resistant. The safe is locked by way of triple expansion bar rods, using a key system Double Mapp A8 on a mechanical lock with three co-axial discs. 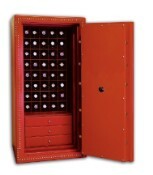 The safe can be finished to specific customer requirements in terms of the number of modules, numbers of drawers and color. The security grading of Underwood safe is Grade A in accordance to the Italian Insurance Group ANIA. To provide the maximum protection and security these units are not manufactured in series, so that each unit can accommodate the needs of each individual client. Each Underwood safe is built with security features corresponding to European and International norms and standards. Every Underwood safe can be fitted with a number of the Underwood watch winding modules and can also be built to provide ample possibility for the storage of other precious items. Following in the long tradition of Underwood's exclusive leather goods, each safe can even be covered in exclusive leather in a color and style selected by the client.